A slab of clay is exactly what the term implies, a ball of clay rolled out to an even thickness with a large dowel or rolling pin, and the rough edges trimmed off. Much of the contemporary pottery that you see in shops and exhibitions is, in fact, made from slabs joined together. In working with the slab, you will find that it lends itself not only to geometric shapes but also to more spontaneous ones. The technique of coiling goes back in time as far as pottery itself and is the process which eventually led to the wheel method. With the hands, clay is rolled into long coils which are joined and circled round and round to build a vessel or other form. Since the two major approaches to hand-built pottery are slab and coil, it’s important to point out how well these methods can be combined. When you learn how to throw on the wheel, you can add a wheel-thrown spout to a slab bottle, slab handles to a thrown vase, etc. The variations are limitless. To watch an experienced potter throw a ball of clay onto the spinning potter’s wheel and then to see them manipulate and control the plastic material so that it literally grows into a full-blown form is an exciting and sometimes awe-inspiring experience. 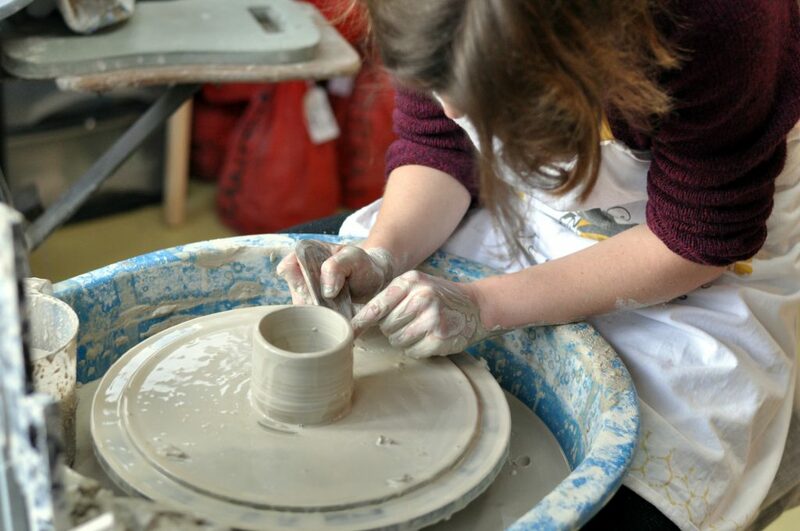 As you become more involved with the craft of pottery you will eventually want to learn wheel throwing yourself. One of the advantages of this method is that forms can be shaped rapidly and, with practice, they can be easily duplicated. There are several ways of making pottery in moulds in order to repeat shapes, such as bowls or mugs, or flat shapes with rich surface decoration such as tiles. One of the most direct is the press mould method in which a slab of clay is laid over a plaster mould and pressed onto it. The excess clay is then trimmed away, the surface smoothed, and the clay form removed. A moulded form though repeated many times can still retain a fresh and individual look by applying additions such as handles or pedestals, textures or glazes. In factory production, slip casting moulds are used to make objects such as dinner plates in exact duplicate – with the decoration also standardized. However, this process is also used by the hand potter as a shortcut to sturdy plates or platters which can then be finished individually, usually with painted glazes. A slip casting mould, which can be purchased, consists of two halves, made of plaster, with a cavity in between. Slip, which is liquid clay, is poured into the space inside. Excess is poured out leaving the shape behind. This can be done several times depending on the shape. After the slip has hardened, the shape is removed from the mould. Slips are available from any ceramic supplier and come in a wide range of colours. Sand casting, another popular mould technique, allows you to make large, strongly textured pieces, and to repeat what you have made. For this or other container shapes, a model for half of the form is built up in wet sand and the surface textured with a blunt stick or another tool. Layers of plaster are poured over the sand mould and allowed to harden. A slab of clay is laid over the inside of the shell and pressed into it. After the clay has stiffened enough to hold its shape, it is removed, and the process repeated. Egyptian paste is a kind of clay that duplicates closely the material from which the ancients made their ceramic beads. It is a self-glazing, low-firing clay body that was probably discovered by accident when a mixture of sand, clay, potash feldspar and soda ash were fired. Jewellery can also be made with regular clay, but this must be dried, then bisque-fired, glazed, strung on nichrome wire, and fired again. Egyptian paste needs only to be shaped and fired. The materials can be purchased from any pottery supplier. Egyptian paste can be handled in the same fashion as regular clay: it can be rolled, made into slabs, patted, pinched, or any of the other various forming methods from which beads can be cut or otherwise made. When the basic form of a pot has been made either with slabs, coils, on the wheel, in a mould, by casting, or with a combination of these, there are two ways of decorating or finishing it. The surface of the clay can be textured, or the entire pot, or parts of it, can be glazed. Texturing is a blanket term for the processes that give variation to the clay surface; some of the methods used are carving, scratching, stamping, adding coils, slabs, or bits of clay. Tools can be any that do the proper job, from a professional scraffito tool to pencils, nails, or your hands. Even such basic means as pinching can be effective on certain forms. Clay, the basic raw material of pottery, is plentiful and inexpensive. There are clay beds in many parts of the country where clay is mined not so much for pottery as for industrial uses. Most clay, as it comes from the ground, is full of impurities and is mixed with rocks, pebbles, and sand. It must, therefore, be refined before it can be used by industry or the potter. Many craftsmen enjoy digging their own clay and – processing it, but since this is such a time-consuming operation, and good, reasonably-priced clay bodies are available almost everywhere, we will concentrate on their use rather than on how to prepare them. Essentially, it is granite-type rock that has been eroded into tiny particles over millions of years. It is found in the same position as the parent rock – these are known as primary clays – or in the bottoms of lakes and lagoons, the particles having been washed there from the high rock formations – these are known as secondary clays. The plasticity or workability of clay is of primary importance to the potter, and the fineness of the individual clay particle has much to do with its plasticity. Since the original particle size of the secondary clays was small enough to have been carried by water, these are finer, and therefore more plastic, than the residual type. It is the secondary ones which make up the bodies that most potters will use. First among the secondary clays are the following: kaolins, ball clays, fireclays, stoneware clays, and earthenware clays. Most generally used by potters today are stoneware clays which generally fire to a light grey colour and mature between 1250°C and 1300°C. These result in ware that is hard and vitreous, ideal for pots that must be handled a great deal or withstand heat, such as cooking ware. Sedimentary kaolin is a natural clay composed mainly of silica and alumina and when formed makes the finest whiteware body available. It withstands a very high degree of heat. Ball clay resembles kaolin in chemical content but is finer and more plastic. When fired, it is almost white. Fireclay resembles kaolin in chemical content but contains more iron causing the clay to turn buff coloured when fired. Its endurance of high heat enables it to be used as firebrick and as lining and shelves for the kiln. Stoneware is usually made from several natural clays plus alumina and silica, to give it the desirable characteristics of plasticity, colour, and the correct firing temperature. When fired, it becomes hard and vitreous, able to hold water without being glazed. It generally fires to a light grey but sometimes may be tan or even slightly reddish. Earthenware is usually made from a natural clay and is low fired, as opposed to stoneware which is high fired, maturing at a kiln temperature between 950°C and 1150°C. The body is non-vitreous and will not hold a liquid unless glazed. The colour after firing is usually buff or red. Porcelain is made from a prepared body containing kaolin, ball clay, feldspar, and flint. Hard, non-absorbent, of pristine whiteness, translucent in thin areas, it requires the highest fire of all pottery wares – up to 1450°C. Since it is not very pliable and requires more skill to work, it is not recommended as a clay body for beginning craftsmen. After you have finished making a pot, the next step is to let it dry completely, so that all moisture is gone from the clay. The pot is then placed in a kiln or furnace which is heated to temperatures ranging from 650°C to 1300°C, depending on the type of clay body from which the pot was made. Initially, there is a bisque or biscuit firing to 1000°C to transform the clay to hard, moisture free material. The object here is to heat the elements which comprise the clay to the point where they fuse. The colour of clay is also transformed during this process and what you might have known in the workshop as a dull grey can become a warm and appealing off-white buff, tan or dark red, even black. Fired clay always has a matt surface; the glossy surface that you have seen on pottery is called glaze. When cooled, glazes can be used to decorate the fired object and then refired to between 1100°C and 1300°C depending on the type of clay used. Traditionally, Raku ware is a type of Japanese pottery used in Japanese tea ceremonies, most often in the form of chawan tea bowls. It is traditionally characterised by being hand-shaped rather than thrown producing fairly porous vessels, which result from low firing temperatures with lead glazes and the removal of pieces from the kiln while still glowing hot. In the traditional Japanese process, the fired raku piece is removed from the hot kiln and is allowed to cool in the open air. The familiar technique of placing the ware in a container filled with organic, combustible material is not a traditional Raku practice. Raku techniques have been modified by contemporary potters worldwide.